1. Despite the specific requests of the Assassination Records Review Board, very few assassination-related documents have been provided by NSA. The bulk of them were from their counsel’s office. While the CIA and FBI turned over hundreds of thousands of documents, only a few hundred were provided by NSA. 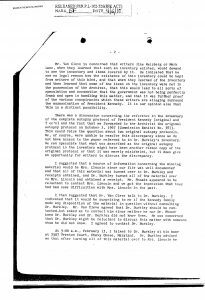 NSA flatly asserted that none of their intelligence documents contained anything of investigatory significance to the JFK assassination. This statement is nonsensical, and should be given no weight. 2. In the same vein, all of the military intelligence agencies provided very few documents in comparison to the CIA and the FBI. One minor but illustrative example is the failure to find any records for the Director of ONI from 1959-1964. There are very few records of their handling of anti-Castro assets, agents, and informants. Their collective response is equally nonsensical to that of the NSA, and should be construed as a non-response. 4. At least 18 Staff D dispatches to NSA during autumn 1963 are missing from the files. 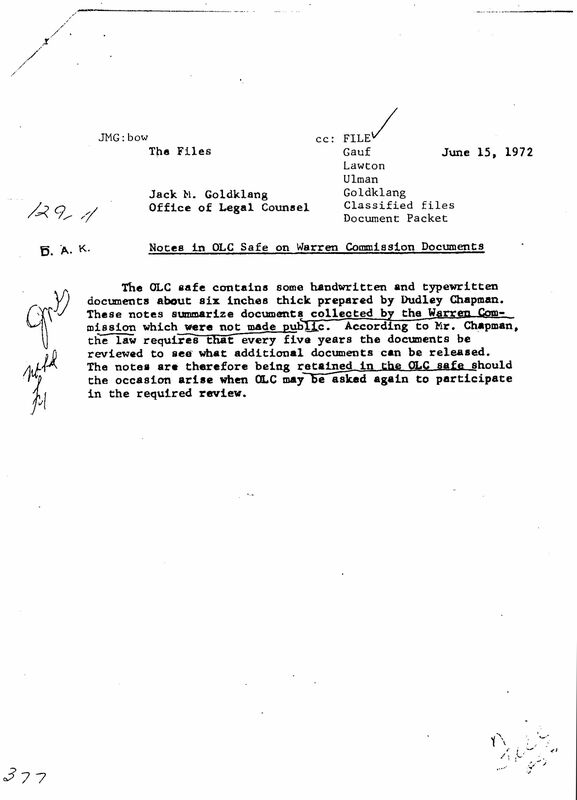 On a couple of occasions, including 8/31/78, these specific Staff D documents were requested. The HSCA was told that the eighteen documents directed to Staff D remained unretrievable, because no “file number” was assigned to them. The logical conclusion is that these dispatches received no “file number” precisely because they involve Staff D.
5. 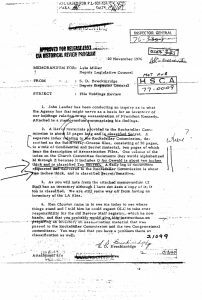 The daily “resumen” (wiretap summary) provided by the LIENVOY basehouse monitors for the period from 9/15/63 to 10/15/63 has not been provided despite a specific HSCA request – a full response as required by the JFK Act would have demanded all relevant resumen for a much longer period of time. – – A former National Security Advisor to the president is caught stealing documents under his shirt, some of his own records from the Archives II, where the JFK Collection is kept. – – The night time janitor at a major history museum sells off major artifacts to a collector for beer and cigarette money and is only caught after the collector showed off his rare relics at a gun show. – – An archivist with the National Archives and Records Administration (NARA) is caught selling rare photos, films and documents over eBay, including JFK Assassination Records. – – John Newman makes copies of Eisenhower era documents on political assassinations that a few years later are no longer available. The list of missing artifacts, records and documents from ostensibly secure Archives is growing – especially JFK assassination records. If Peter Dale Scott‘s “Negative Template” theory is correct, what is missing from the extant history is more significant than what is in the documentary record. This list began when, during a March 2017 press conference at the National Press Club in Washington, I asked Federal Judge John Tunheim if anyone was looking for missing assassination records such as the AF1 tapes and ONI records. So if it’s up to me I’m going to start looking by making a list of them and prioritizing them as to most significant and easiest to find. In a private conversation afterwards Judge Tunheim gave me his card and asked me to send him a list and he would look into it. I began the list with the CIA OS Volume Five file on Lee Harvey Oswald, as it was found missing by Malcolm Blunt and given some publicity. I added a list of my own and after posting them received a response from a number of other prominent researchers with lists of their own. Oswald CIA Office of Security File Volume 5, last seen by the House Select Committee on Assassinations (HSCA). Files of the first chief council to HSCA Richard Sprague, who took his files home with him when he was fired for conducting a real investigation. 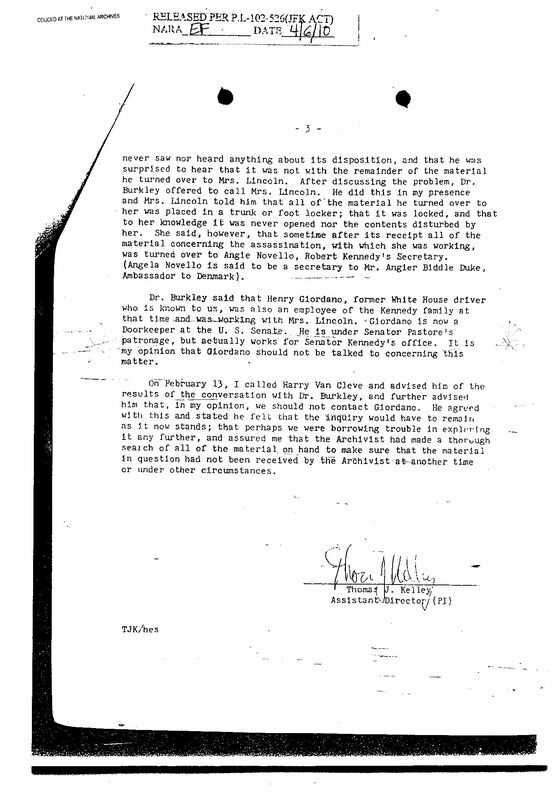 The Assassinations Records Review Board (ARRB), responsible for identifying and obtaining records, missed them because they confused the attorney Richard Sprague with the computer programmer of the same name whose extensive files on the assassination are part of the JFK Collection. Sprague’s HSCA files, paid for by taxpayers that rightfully belong at the Archives, are currently in Sprague’s Philadelphia law office. 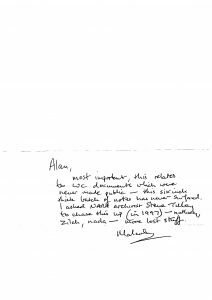 Soviet KGB records of Oswald’s time in Moscow and Minsk that were obtained by Norman Mailer are now in the possession of Mailer’s former associate Lawrence Schiller, who refused to turn them over to the ARRB. Unedited AF1 Radio Transmission tapes from November 22, 1963. Two different edited versions of these tapes are available, one on cassette tapes released by the LBJ Library and a reel to reel version discovered among the personal effects of General Clifton. The White House Communications Agency (WHCA) is responsible for these tapes. As Vince Salandria has pointed out there was a transcript of the complete AF1 radio transmissions in the LBJ White House, where two reporters – T. H. White and William Manchester were permitted to read it and quote from it. They recount conversations not on either of the extant tapes. Possible sources – LBJ Library, Collins Radio, Cedar Rapids, Iowa, WHCA – Dallas Sheraton, Dallas Civil Defense bunker, SAC Bases, Amateur HAM radio club, governments of Cuba, Canada or Australia. 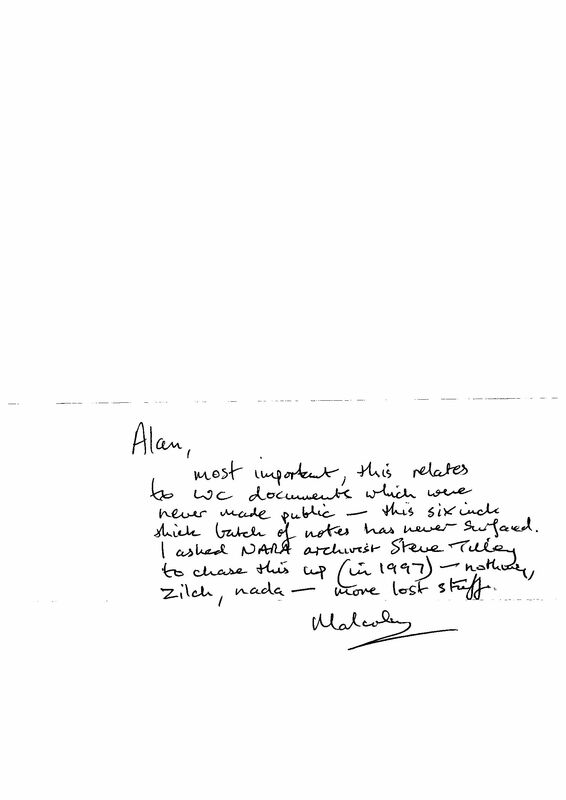 Dan Alcorn notes: Joan Mellen found that the Bruce-Lovett Report on the CIA covert operations, that Arthur Schlesinger mentions, is now missing from RFK’s files at the JFK Library. David Bruce was the OSS colonel who accompanied Hemingway to liberate Paris, later JFK’s ambassador to Court of St. James, while Lovett was on board of Moa Bay Mining Company in Cuba and the person who recommended Robert McNamara and McGeorge Bundy to JFK. It’s inconceivable their report on CIA operations is missing, but it is. Even the CIA now wants a copy, if you can find one. The Zapruder film briefing boards made at NPIC on the day after the assassination. Church Committee interviews with Gerry Patrick Hemming, Orestes Pena, Immigration and Naturalization Service and Customs officials, and other Church Committee testimony are missing. U.S. Customs records on Cubans, especially by Cesar Diosdado, requested by the HSCA were so voluminous they couldn’t be given to the HSCA, but now consist of only a few records at the National Archives and Records Administration (NARA). The audio tape recording of Gaeton Fonzi’s interview with Mitch Werbell was erased and the transcript is missing, only Fonzi’s notes remain. John Newman says that Eisenhower era reports on assassinations of foreign leaders that he copied years ago are now missing from the NARA, and he believes such records are being deliberately stolen. 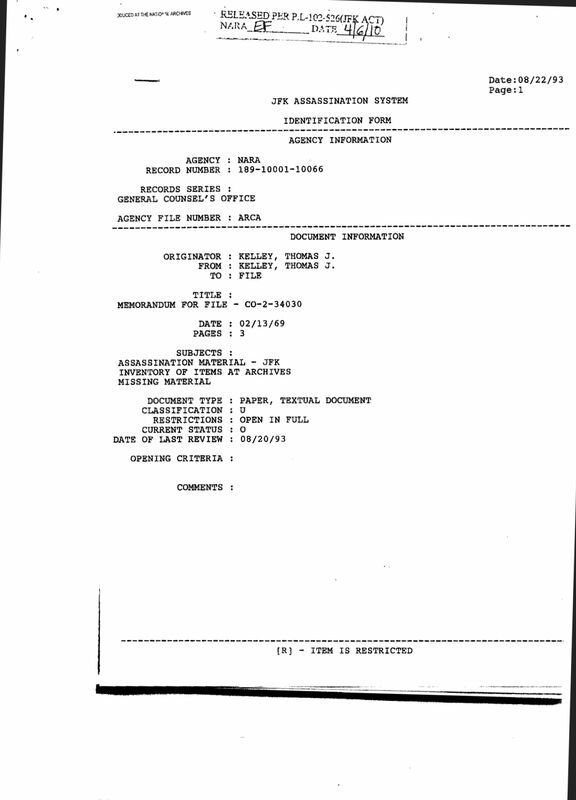 Bill Simpich says that CIA Mexico City Station (MCS) cable to Headquarters from September 26-30, 1963 are missing as well as cables from CIA HQ to MCS, JMWAVE to HQ and HQ to JMWAVE cable traffic on the same dates, and all cable traffic between MCS and JMWAVE between September 26 and October 20 and November 22 to December 30, 1963 are missing. 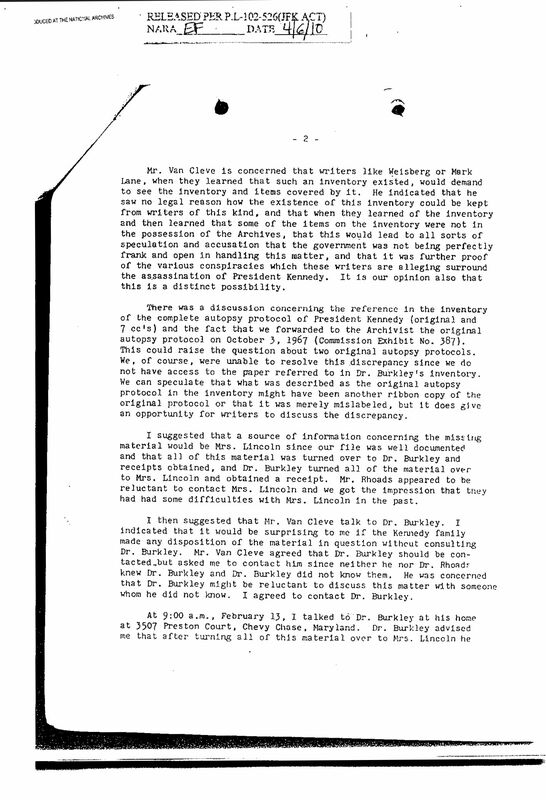 The CIA’s study of the July 20, 1944 attempt to kill Hitler to be adapted for use against Castro, as mentioned by Desmond FitzGerald in his September 23, 1963 briefing of the Joint Chiefs of Staff, is the subject of a FOIA lawsuit by the Assassination Archives and Research Center (AARC). 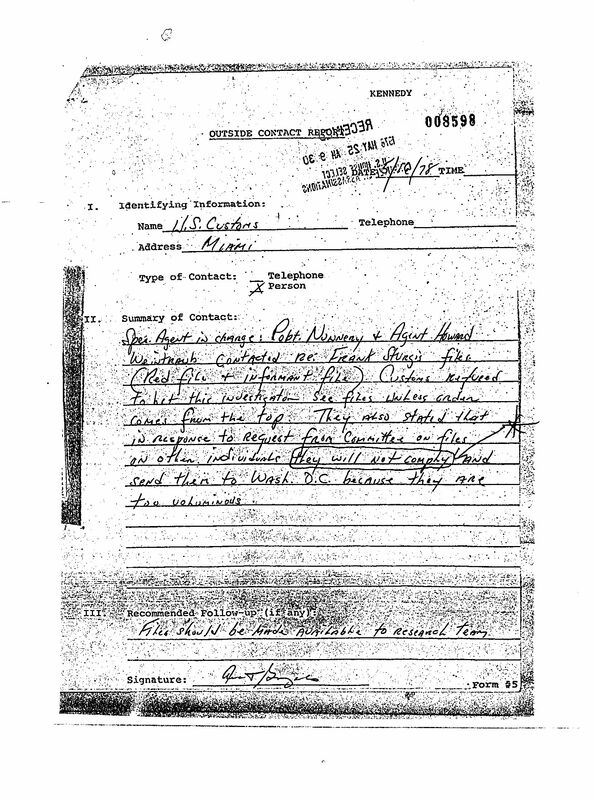 Office of Naval Intelligence – ONI Defector File, as identified as an assassination record by Navy Lt. Com. T. Pike, but never turned over to the Archives. ONI 119 investigation reports on Oswald’s defection and the assassination, as referred to by the Navy investigators who wrote them and the officers who read them. The assassination files of the Director of the ONI Rufus Taylor, whose office had undercover agents working in Jack Ruby’s Carousel Club, installing and maintain the sound system, who reported, in the only surviving document, that Oswald was seen in the club. 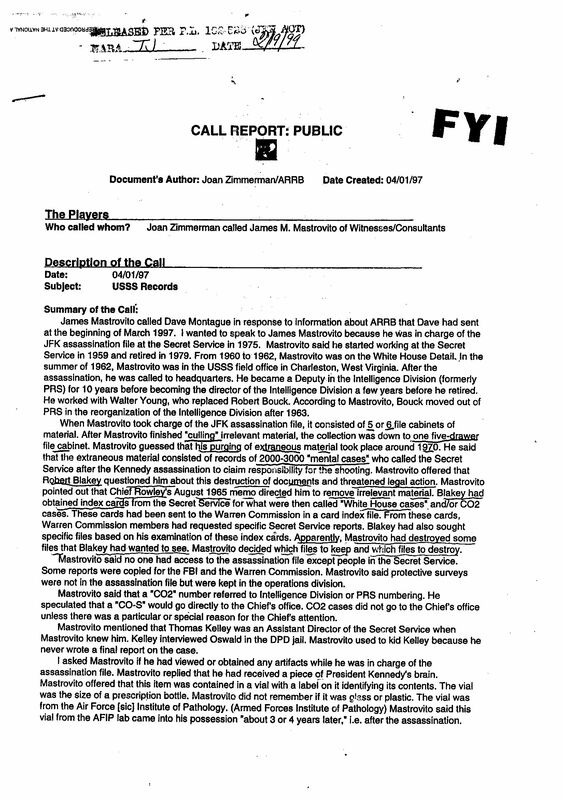 James Mastrovito – the Secret Service Agent responsible for the SS records on the assassination acknowledged to the ARRB that he “culled” – destroyed many records and flushed into a food processor a vial of material labeled “JFK brain – Armed Forces Institute of Pathology,” with no repercussions. The Secret Service destroyed many records, including the Advance Reports for the Tampa trip after the JFK Act was passed by Congress, although copies of some of these records were found among the personal effects of Agent Gerald Blaine, who wrote the Tampa Advance report. Do other agents also have copies of official records among their personal effects? Is anyone looking? The “Homme Report” from a Congressional subcommittee reportedly contains information on Robert F. Kennedy’s knowledge and approval of CIA plans to kill Fidel Castro. RFK’s date book for 1963 is missing from the Kennedy Library. Four boxes of witness testimony turned over to NARA in April 1965 by US Attorney now missing. OSI – Office of Special Investigation military intelligence review of Oswald’s State Department file is missing. When former US Marine officer Oliver Revill joined the FBI he reported on an investigation of Oswald and files on him at a US Marine base in North Carolina, records not in the public record. 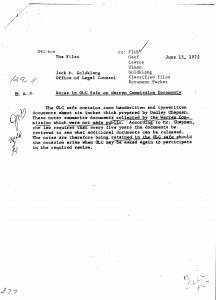 The Department of Justice Office of Legal Counsel had documents excluded from the Warren Commission, according to a memo sent to ARRB and NARA archivist Steve Tilly, “more stuff lost in the shuffle,” says Malcolm Blunt. The ARRB tried to obtain Oswald’s New Orleans court records but were told they were accidentally destroyed when sent for microfilming. Army Intelligence files on Oswald were kept from the Warren Commission and then “routinely” destroyed. Larry Haapanen notes, White House Situation Room Incoming-Outgoing Message Log for 11/22/63-11/30/63 (the extant log for November 1963 ends abruptly on the morning of 11/2263). Records of the Dallas-based 488th Military (Strategic) Intelligence Detachment (Counter-Intelligence) unit histories and rosters 1962-1963.30. 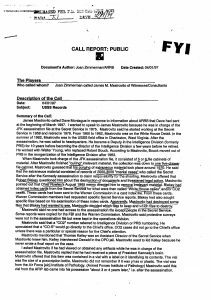 Records of FBI wiretapping of Oswald while in police custody as well as post assassination taps of Ruth Paine and Michael Paine and Marina and Robert Oswald phones, as reported by Irving police Chief Paul Barger. 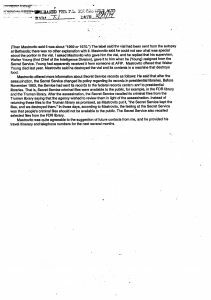 Records of FBI wiretapping of Oswald while in police custody as well as post assassination taps of Ruth Paine and Michael Paine and Marina and Robert Oswald phones, as reported by Irving police Chief Paul Barger. White House Communications Agency (WHCA) records for 11/22/63 including tape of Secret Service motorcade security radio channel that included Roy Kellerman talking as the third shot was fired, and radios in LBJ’s car, the AF1 cockpit and the WHCA base station at the Dallas Sheraton hotel. Missing Mexico City records include LILYRIC (Soviet embassy photo records, Sept. ’63); LIFEAT (wiretap records, for all of 1963), daily resumen wiretap summaries for 1963, and records withheld by ARRB at request of CIA and FBI that may be released in the October 26, 2017 data dump. Many relevant FBI 134 Informant records are missing or being withheld. FBI dispatch tape of Dallas calls for 11/22/63 is missing. 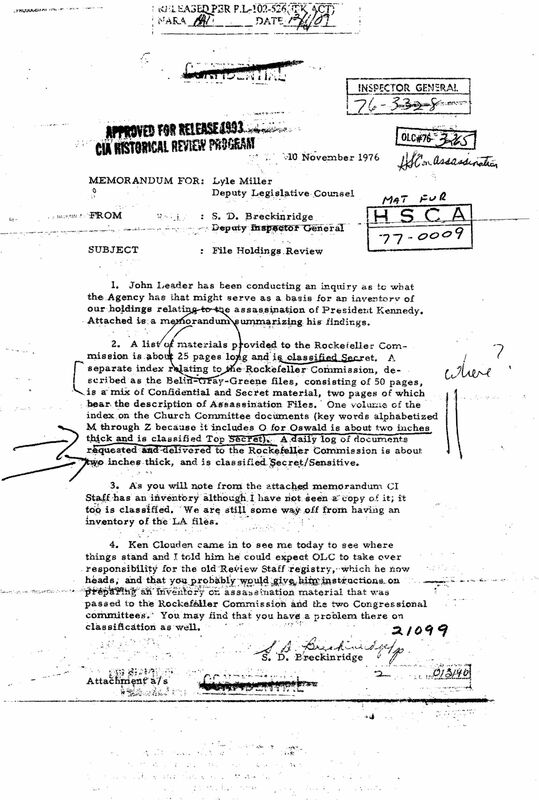 The National Photo Interpretation Center (NPIC) report on their study of the Zapruder film and Art Lundal’s briefing of CIA Director John McCone is missing, though McCone told RFK that the CIA said there were two gunmen. 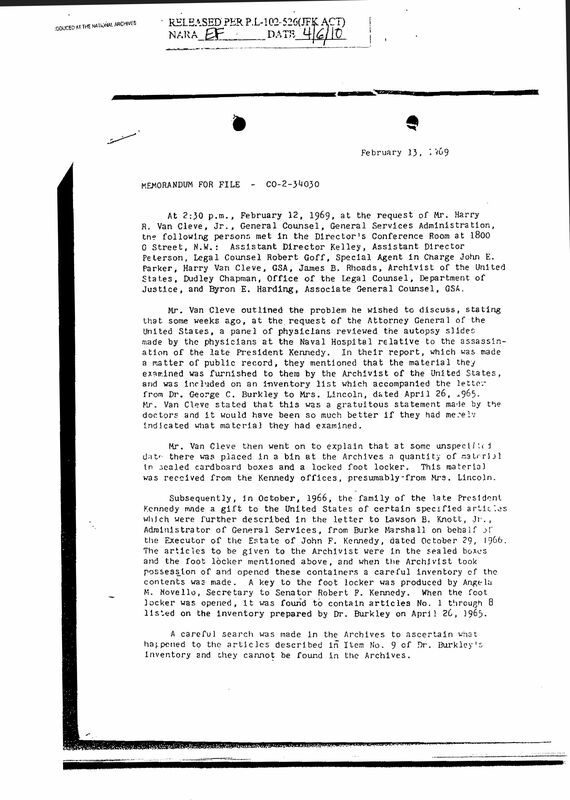 The JMWAVE NPIC records and other NPIC assassination records were, according to a NPIC secretary, boxed and at the orders of Robert Kennedy sent to the Smithsonian Institute instead of the NARA. 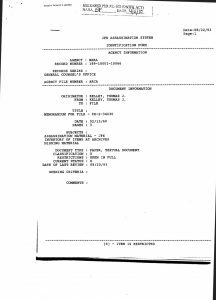 FBI’s Mexico City file MX 105-2137. Let me begin with the Board’s explanation of why this file, brought to their attention by me, was not seen by them. 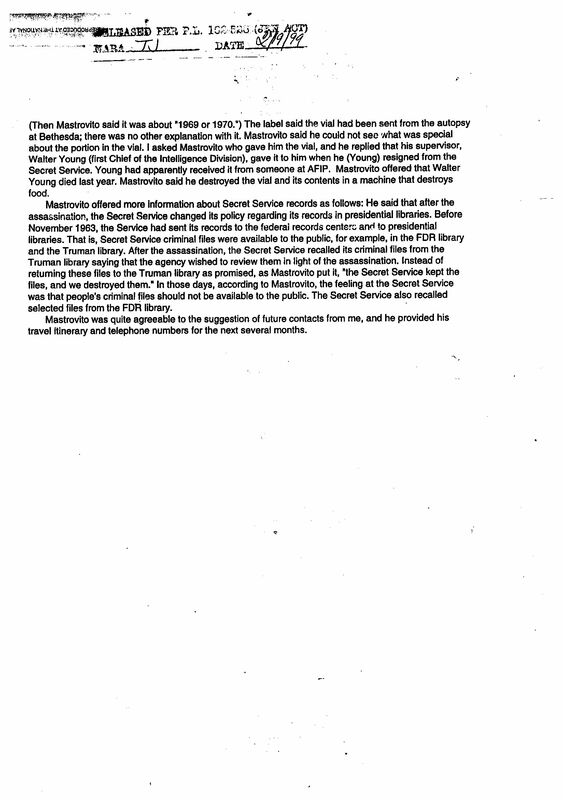 Malcolm Blunt: FBI espionage “65” File on Oswald, Correspondence between Office of Security (Bruce Solie and David Slawson during WC investigation….second part of Bruce Solie HSCA Security Classified Testimony, full debriefs of INS and Customs officers at the Department of Justice following their testimony to the Church committee (all missing). Mexico City Station to Headquarters (September 26–30, 1963); Headquarters to Mexico City Station (September 26–30, 1963); JMWAVE to Headquarters (September 26–November 21,1963); Headquarters to JMWAVE (September 26–November 21, 1963); and all traffic between the Mexico City Station and JMWAVE for the periods September 26–October 20, 1963 and November 22–December 30, 1963. Records of the Dallas-based 488th Military Intelligence Detachment (Strategic) and 349th Military Intelligence Detachment (Counter-Intelligence) — for example unit histories and unit rosters from 1962-63. 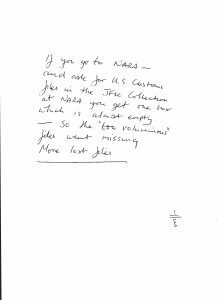 41) Employment records of LHO collected by the FBI from the Pfister Dental Lab have disappeared. 42) Stripling Junior High (Ft. Worth) records of LHO’s attendance in 1954, collected by the FBI, have disappeared. 43) The “original” US postal money order, allegedly used to pay for the MC rifle, has disappeared. 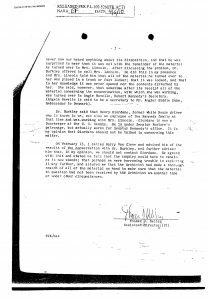 44) Documents relating to LHO’s discharge from the Marine Corp in March, 1959, reviewed by asst Provost Marshall William Gorsky at El Toro, CA., disappeared. 45) LHO’s Texas driver’s license (and file), seen and handled by numerous employees at the TDPS, disappeared. 46) The Oswald wallet, produced by Capt. Westbrook at 19th & Patton and shown to officers and FBI agent Barrett, was last seen in the hands of Capt. Westbrook. 48) All original NYC school records of LHO disappeared while in FBI custody. Only photographs remain in the National Archives. 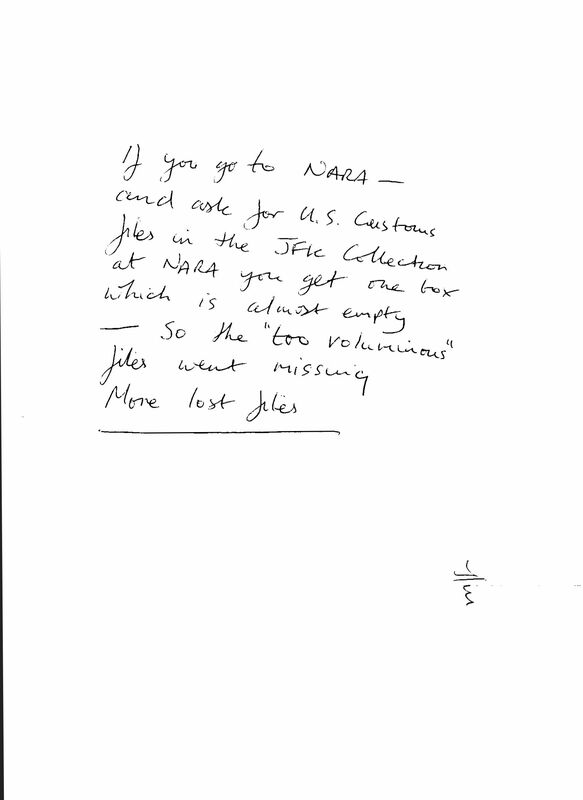 50) Interviews by Edward J. Epstein of US Marines who knew LHO in Japan, the Fulton Ousler Collection, kept for years at Georgetown University, are now missing. 51) Complete files of LHO’s attendance at radar school in Keesler (2 files with two different numbers; two different graduation dates; two different class numbers, etc). 52) Marine Corps unit diaries for LHO at El Toro, CA from December, 1958 thru March, 1959. 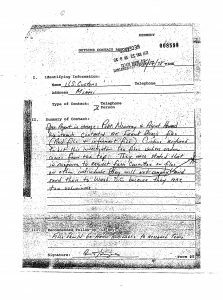 53) Interviews by John Hart Ely of Marines who knew LHO at El Toro, CA are missing. 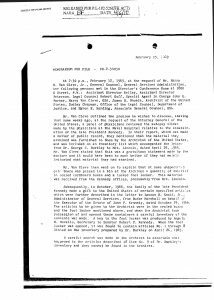 54) All employment records of Marguerite Oswald from 1955 thru 1963. 55) SS records for Marina and LHO.